If you want to learn how to knit socks, but it scares you a bit, start small! This baby sock pattern guides you through each step, setting you up for success. Often, the hardest part of socks is understanding the shaping and construction. By the end of this project, you'll have a grasp on it and your sock knitting fears will be gone! Your finished sock will be the size for a baby and you can knit another sock if you like. Even if you're not knitting this for someone, it's a good sample project to learn a few skills see if you'll enjoy knitting socks. Cast on 20 stitches onto one needle. Next, distribute the stitches onto three of the four needles. Slide the stitches to the end of the needle, beginning with the first cast on stitch. Slip 7 stitches one at a time onto another needle. Slip the next 6 stitches onto a third needle. Once the stitches are evenly distributed, join the work in the round. Slip the first cast on stitch onto the needle with the last cast on stitch. Slip the last stitch over the first stitch and onto the last needle. At this point, you can slip a stitch holder onto the needle to mark the end of the row. Or, you can note where the tail from your cast on is; this is the end of the row. Work in knit 1, purl one ribbing for 4 rounds. Use the fourth needle to work across the stitches on one needle. After that needle is empty, use it to work across the next needle, and so on. If you're new to double-pointed needles, you might need to knit a little slower than usual. Once you've knit a couple of rounds, the work will feel much more stable. Knit every round for one inch. When knitting in the round, knitting every row produces stockinette stitch. The leg is the part of the sock that often has interesting stitch patterns or cables worked into it. But when you're first learning, simple stockinette makes it easier to get started. There are different methods for knitting a heel, but one of the most common is using a heel flap and then "turning the heel". Knit the first 10 stitches of the round onto one needle. To make it easier to work with, slip the other 10 stitches onto one needle and allow them to hang while you work on the other stitches. Row 1: (wrong side) Slip the first stitch purlwise with the yarn in front, purl the rest of the stitches. Row 2: Slip the first stitch purlwise with the yarn in back, knit the rest of the stitches. Repeat these two rows 4 more times, until you've worked 10 rows total, ending on the knit side. Turning the heel is a common method for making the cup your heel sits in when you wear the sock. This method uses short rows, turning the work and knitting back over the stitches you just worked without knitting across the whole row. As before, slip the stitches purlwise with the yarn in front. Row 1: Slip 1, purl 5, purl 2 together, purl one. Turn the work, leaving one stitch unworked. Row 2: Slip 1, knit 3, slip, slip, knit (SSK), knit 1. Turn the work, leaving one stitch unworked. Row 3: Slip 1, purl 4, purl 2 together. Turn the work. There are no unworked stitches. Row 4: Slip 1, knit 4, SSK. There are no unworked stitches. Six stitches remain on the needle. The gusset of a sock knits the leg stitches and the heel stitches back together. It shapes the sock so it fits around the heel and the top of the foot. Take an empty needle and pick up and knit six stitches along the side of the heel flap. The stitches should be easy to find because they are the slipped stitches along the edge of the heel flap. Use another needle to knit across the 10 stitches of the leg you left unworked as you made the heel flap. Use the newly empty needle to pick up and knit six stitches along the second side of the heel flap. Knit three of the stitches from the heel itself. Slip the last three stitches of the heel onto the needle with the first stitches you picked up. Use the newly empty needle and knit the three slipped stitches, along with the first stitches you picked up. The stitches from the leg are on needle one, the next needle is needle 2, and the needle you just finished knitting is needle 3. Now it's time to shape the gusset. Row one: Knit across the first needle. On the second needle, knit 1, SSK, and knit to the end of the needle. On the third needle, knit to within 3 stitches of the end of the row, knit two together, and knit the last stitch. Row 2: Knit every stitch. Repeat these two rows until you have five stitches on each of the second and third needles; 20 stitches total. Once you have the gusset shaped and are back to 20 stitches, knit every stitch in every round for another inch. This makes the foot part of the sock. Now it's time to shape the toe of the sock. As before, the stitches on the top of the sock are on needle one, followed by needle two and needle three. Row 1: On needle one, knit 1, SSK to the last three stitches, knit 2 together, knit 1. On needle two, knit 1, SSK, and knit to the end. On needle three, knit to the last three stitches, knit 2 together, knit 1. Row 3: Repeat row 1. You will have 12 stitches remaining. Slip the stitches from needle two onto needle three so that you have two needles with 6 stitches each. To finish the sock, practice the standard way of closing off a sock, known as grafting or the kitchener stitch. Weave in the ends. Now you know the basics for making a sock! 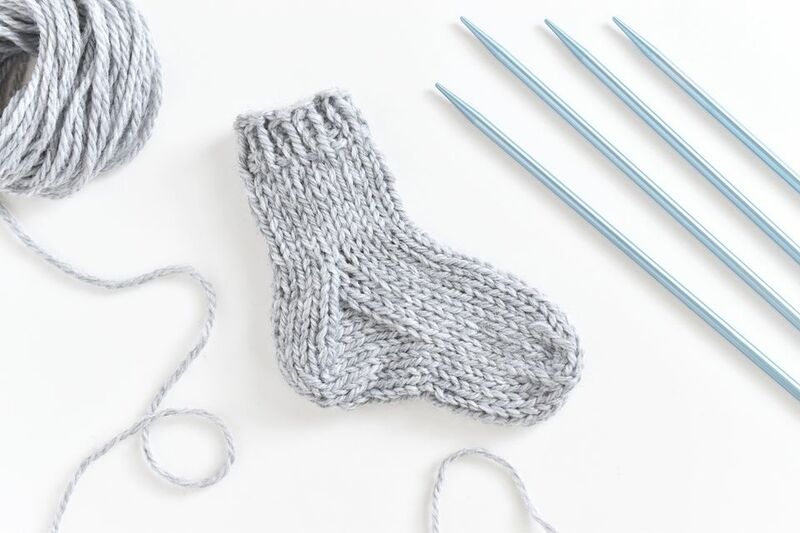 You can make a matching sock to give as a gift, or fill it with lavender to use as a sachet!